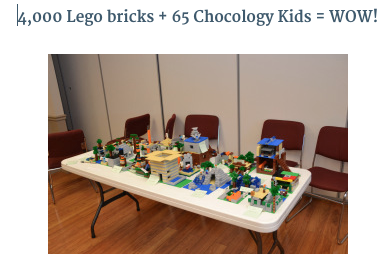 4,000 Lego bricks + 65 Chocology Kids = WOW! This past weekend Chocology sponsored the Lego/Minecraft build at the WMHO Lego Contest in Stony Brook, New York and what an event it was! Over 145 parents, kids and young adults participated in both building and enjoying the Lego exhibits. The atmosphere was so much fun; we can’t wait to sponsor this event again next year! We had kids ranging in ages from 2 to 22 join us for the Minecraft Lego build. Throughout the day we had some pretty amazing designs created, some of which will travel with ILUGNY to the Brick Fair event held in New Jersey in October. Each participant in the Chocology/Minecraft build received a Certificate of Awesomeness and will also receive a sweet treat when they visit the Chocology booth at the Port Jefferson Farmer’s Market. Thank you to all of our participants for making this event one to remember! Also on display at the WMHO Lego Contest and event were a 6-foot Empire State Building, the New York skyline and over 50 other contest entries. The winner of the contest will be announced at the closing ceremony on October 16. Chocology couldn’t have done this without the help of four special teenage volunteers. Thank you to Madeline, Katherine, Allen and Alina who supported this event in the areas of design, marketing, building and clean- up! We appreciate your help and look forward to working with you all again! It was such a privilege to work with WMHO and ILUGNY at the Lego Build this year! It was a festive event that we will be looking forward to year after year. We are posting many of the photos that we took at the event. All of the creations were absolutely wonderful however we could only post a few of the photos. We apologize if yours didn’t make the blog, there are more photos on our Facebook page. To learn more about Chocology and Chocology Kids, follow us on social media at Facebook, Twitter and/or Instagram! We look forward to bringing you more sweet Chocology Fun events!